Image 1 “The Fan Girl” … #NikonZ7, ISO1000, 1/125 at f1.8 S lens, WB Sepia using in-camera Picture Control with M1.0 Magenta … Lit using modeling lamps. This past November I was invited to come to Nikon Japan in Tokyo to give a Z7 Presentation to 100 of Nikon’s engineers. I pulled a variety of images for the Presentation that would showcase not only what the Z7 camera will do to move my imagery forward, but I would also (at Nikon’s request) bring to light possible improvements and additions photographers would like to see in the next “Z” camera. Images of SPORTS, Macro, High Speed Sync Speedlights, Landscapes and Lightpaintings that had been made since the #Z7 was released in October were included. Assembling the Presentation was going well until I noticed that I had not had a portrait session using the NIKKOR Z NIKKOR 50mm f1.8 S lens. I was leaving for Tokyo in only 3 days…surely Haley will know someone who would pose for a Z 50mm f1.8 portrait… and she did. Meet Kalia, a friend of Haley’s who is of Japanese descent and models with vintage 1940’s wardrobe. I absolutely love this picture! … And so did Nikon! Simply done using two Modeling Lamps in Cross-Light configuration: Key lamp with a 10 degree Grid, and a second lamp with Strip Box and Grid to faintly fill the other side of her face. I hand held the Z7 using the in-camera Vibration Reduction (awesome!) and used Pinpoint AF which allowed me to precisely focus on the far edge of her lower lip. I set the in-camera Picture Control on Sepia (stunning) and added M1.0 Magenta. The Z lens Bokeh is Fantastic! I was blown away by how beautifully the aesthetic quality of the blur produced in the out-of-focus areas rendered, looking almost like a f1.4 lens. Image 2 “Flying Colors” … #NikonD850, ISO2000, 1/125 at f6.3, NIKKOR 24-70mm f2.8 lens, 2X Soft Graduated Neutral Density Filter, WB 7140K. The BEST sunsets for Colorado occur in the Fall and living near a lake offers many evenings of photographing skies full of vibrant color. 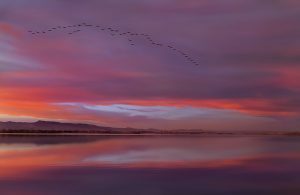 On this particular evening I set up well south of the “customary” flight path of the migrating Canadian Geese and hoped to make some long exposures in an effort to smooth the water to look “ice-like” while capturing some lovely color in the sky. My #D850 with NIKKOR 24-70mm f2.8 lens (at 40mm) was mounted to a tripod using a 410 Geared Head. My exposure was set at 5 seconds and my 2X GNDF was in my left hand. All I had to do was enjoy the sunset while waiting for the color in the sky to look prime and then “dance” the GNDF up and down in front of the lens to “super soften” the GNDF transition. Then, as it so often happens, my plan changed as a team of Geese strayed from their north shore flight path and headed south over the lake straight at me. I quick-released the camera from my tripod and adjusted the exposure accordingly to accommodate the slow approaching Geese using a shutter speed of 1/125 allowing slight motion in their wingtips … and a split second of insecurity swept over me. Raising the camera to my eye and aiming at the undulating wedge I began composing as they approached. With the glass 2X soft GNDF pressed against the front of the lens the value of the sky nearly matched the reflection in the water. 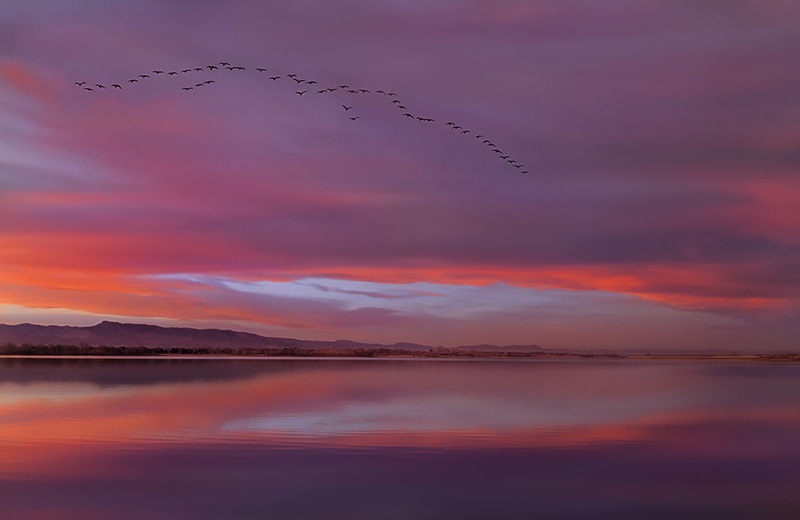 I watched through the viewfinder as the advancing Team of Geese rose above the Orange, then above the Magenta, and finally up into the Violet clouds … I only made a few frames as they leisurely flew overhead. I just love making pictures … of anything and everything. There’s a sense of joy that I experience each time I press the shutter button, but there’s also a sense of insecurity when my plan changes. Perhaps Photography is the same as Life. @nikonusa #nikonnofilter #nikonambassador @nikonambassadors #mirrorlessreinvented. 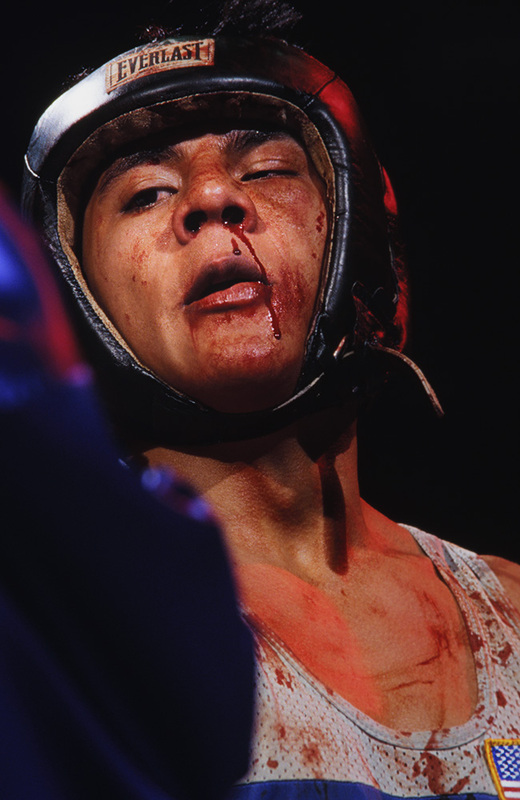 Image 3 “Bloody Boxer” … This image was captured on Slide Transparency film back in 1997 before the Digital Revolution began. Back then there was no LCD monitor to see if you had the shot but in the case of this boxer I felt certain that a story of a grueling match was being conveyed. I photographed the entire championship boxing competition “on Strobes” which were located in the arena catwalk system high above the Boxing ring, to which I had placed a Red Gel over the front 2 of the 4 strobes to give some colorful enhancement to each 3 round Championship match. You cannot predict the outcome when covering any athletic event and in this case the use of Red Gels over the strobes I had no pre-knowledge of the bloody bout that would occur. Well, I hope that you enjoyed these Images and Backstories of how these pictures were made. I encourage all photographers to break out of the usual genre they are accustomed to and “Experiment” with a variety of Subjects, Techniques and Lighting styles. … you never know what you might “connect deeply” with and discover a new passion.